A few weeks ago I stopped by my bank and asked the girl behind the counter for thirty brand-new one dollar bills. After she figured out that I wasn't actually kidding, she told me that they didn't have any, but offered to go through all the money in her drawer and pull out thirty bills in the best shape that she could find. Now, I know that I've made cracks about living in a small town, and I can tell you, it's not always fun residing in the middle of nowhere. That said, sometimes living in a small town rocks--like when you ask the bank teller for new bills and she takes the time to sort through hundreds and hundreds of dollars just to get you thirty crisp, fresh(ish) bills. 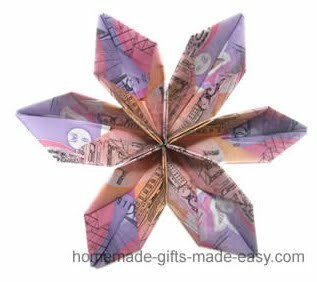 I'm not usually that particular about my money (in fact, I rarely ever carry cash), but in this case, I needed the nicest bills I could find, because I was going to do a little bit of money origami in order to make the flowers for my toss bouquet. 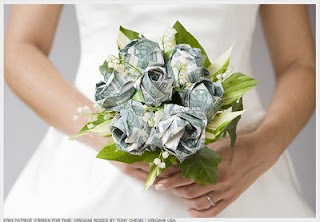 You may remember that Mr. Goodlaff and I are foregoing the typical bouquet toss in favor of a more inclusive, money bouquet toss, and since money flowers don't grow on trees, it was time to get folding. All three of these options used at least three one dollar bills. I had every intention of doing a variety of flowers for the bouquet, so I actually started to fold all three of the flowers. The first tutorial I tried was the easiest, and so I was completely spoiled (the first one pictured, for those of you playing at home). Easy folds, simple directions, awesome results. I loved the way the flowers turned out, and I really took my time to make sure they came out right. With the second tutorial (picture numero dos), I was lost after about three steps. I was able to fold the bill in half, and that was about it. The format of the tutorial is incredibly inconvenient--you have to press a button to get to the next step, the next step, and so on. I must admit that, given the convenience and ease of the first tutorial, I just gave up trying to figure it out and moved on to number three. Three was again a pain to figure out, and I was reminded of why I don't usually do origami. 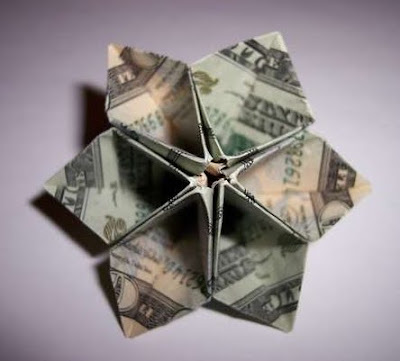 I was that kid in school that could make only one fancy paper airplane and a cootie catcher, and that was about it; clearly, my folding skills are severely lacking. Again, after a few bungled steps of this tutorial, I was done. At that point I figured, if it ain't broke, don't fix it. I cut my losses (five minutes of my time and a crinkled bill) and decided the entire bouquet would be the same flower, made by using the first tutorial. Maybe you follow directions better than I do, but for me, it was by far the easiest flower to make and least time consuming. Two hours of folding later, and I had ten origami money flowers: five "green" and five "white" (depends on which side of the bill place "up"). After completing ten money origami flowers, I can honestly say that I would have a really hard time folding 1000 paper cranes for a wedding. Beautiful though they may be, judging by the way my hands felt after ten flowers and thirty one-dollar bills, I would have early-onset arthritis by the time I was done with a thousand cranes. No, no--ten flowers was much more my speed. So, the flowers were assembled, and it was time to start assembling the bouquet. There was just one small problem: I didn't have any supplies. Aw, shucks, I'd have to go back to the "bad place" (craft store) again! What's most important for you when looking for online tutorials? Is it the promise of the final product, the ease of use, or the format of the tutorial that helps you decide to try a project? Mommy, Where Do Budgets Come From?